Performances of African drummers like Bolokada Conde suddenly let you realize how complex djembe rhythms really are. At first, they may even seem chaotic to an untrained ear. But as you familiarize yourself with these foreign sounds, they evolve into veritable rhythmic poetry! Bolokada has made a name for himself by mastering the traditional rhythms of the Malinke ethnic group and by showcasing them to the rest of the world. 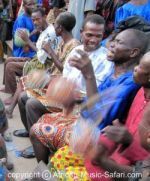 The mastery in itself is no small achievement: The Malinke use several different percussion instruments that play separate beats and blend into one rhythm. Each rhythm has a different history, origin and use. Some pieces may be played at weddings, while others may be for war dances or welcoming young boys into manhood. Bolokada was recognized as a prodigy at a very young age and became a sensation in the Sankaran region of Guinea, West Africa. He was given the title of master folklorist and was sought out to play the djembe at all the major village celebrations in his area. After some years, Bolokada joined the famous Les Percussion du Guinée as their lead drummer. This allowed him to tour the world and showcase his talent and culture in major venues. 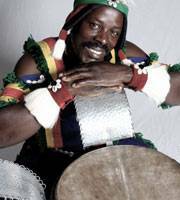 He was since then branded as one of the most exciting, captivating and dynamic djembe players alive. Since 2004, he has been teaching and performing in the United States and Europe. He is the musical director for groups like the Ballet Waraba (North Carolina) and the Ballet Wassa-Wassa (Santa Cruz), among many others. His African drumming classes and workshops are always packed. Students consider them more than worth the tuition price and a three-hour commute. So be sure to sign up if he comes to your area! In case you don't get the chance to learn from this Djembefola personally, you can study with the help of his instructional DVD. It definitely is an experience to see the Master in action on stage! The rhythms that he beats out of his djembe are fantastic. But it's his personality, his facial expressions and his passion for the drums that make the show extraordinary! What do you think about Bolokada?